Bibimbap. Quite possibly the best known and also most tongue twisting dish in Korean cuisine. Its a simple one-bowl combination. Comprised of a base layer of steamed white rice and topped with a colorful arrangement of sauteed vegetables, often some kind of meat (like sliced beef), a runny fried egg and seasoned with the deep flavored and spicy chili pepper paste better known as gochujang. With its balanced arrangement, it has a very eye catching presentation despite its simplicity. But alas, that’s not where it ends. 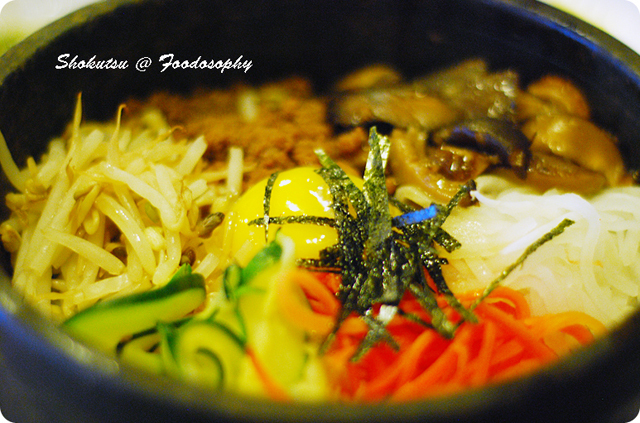 For you see, the bibim in bibimbap really means “to mix”. Combining all of these ingredients, their distinct textures and flavors, so that in each spoonful you get the complete package of tastes available is what makes this dish come to life. Whenever I travel and have the opportunity to indulge in some well known dishes that have made their way to North America, I make sure to partake in them whenever I can. The only time I’ve ever turned down an offer was when I was in Manila two years ago and came face-to-face with a dare to try balut. Partly to experience how its made in the “home country”, and pick up any hints as to what has been adapted by the Canadian version, and to become aware of any obvious misinterpretations. Throughout these experiences and discoveries, I’ve come to learn that more often than not, despite how connected our planet has become in the present day, there are two factors that seem to stand out for me. One, the availability of certain ingredients in “authentic” dishes that are just too rare/expensive/bothersome/perishable for transport to ever retain its presence in the North American versions of these dishes. Two, the acceptance of some ingredients by North Americans is a hard one to overcome, for whatever reason: flavor, scent, appearance, source, etc. I guess there are some things that will just take more time to become mainstream enough to be readily available and acceptable. Nestled along the banks of the mighty Han River quite close to where the north and south arms converge together, is a stretch of walking/bicycle paths and fields that are popular with families out visiting the countryside from Seoul, especially on weekends. I can understand this human need to get one with nature, as when I lived in the city of Calgary, I would often hit the road and go to nearby Bragg Creek, Kananaskis, or even out to Canmore/Banff just to get away from the concrete jungle after a busy workweek. Being in Asia this time, the way the city slickers were out and about in Namyangju‘s beautiful parks and public water lily gardens, reminded me of how busy Hong Kongers head out to the New Territories to get their quiet waterside, “resort” experiences. Korean cuisine is diverse and full of rich history, but in many circles it is known for one major characteristic – it’s heat! And one of the hottest and spiciest dishes is buldak – literally ‘fire chicken’. Reminiscent of the dominating red colour that flooded the streets of Seoul during that country’s incredible run to the final four at the 2002 World Cup, the signage at Red Chicken Korean Restaurant in downtown Vancouver shouted out at me. Earlier this year, I had previously been invited to dine at this place and try their renowned fiery chicken, but finally I was able to join a group outing recently to try it for the very first time. 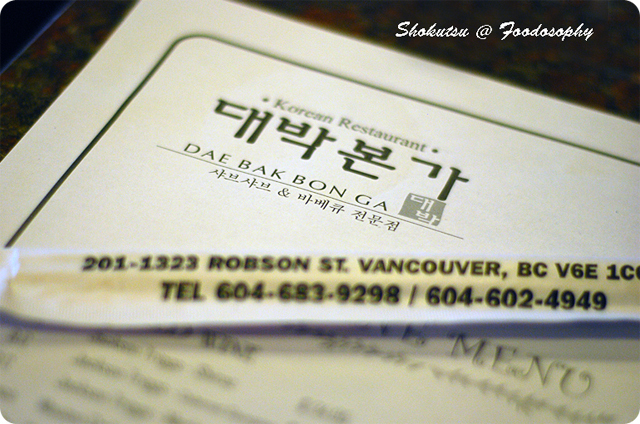 Perhaps a little lost amid the growing epicenter of ‘Little Koreatown’ on Robson Street, I would say more so for the fact that this establishment is not on the ground level and accessible from the sidewalk as many of its nearby competitors offering Korean food, is Dae Bak Bon Ga. With some warmer weather hitting Vancouver of late, I was in the mood for some refreshing and light mul naengmyon (buckwheat noodles in a cold beef broth). This summary is based on my one and only visit that took place recently. Marketing itself as a mix of a restaurant slash karaoke place, I was pleased to see the karaoke section was in the back, and not overly visible upon walking in and being led to a table. Going in around 6:30pm on a weekday, it seemed the karaoke crowd was not yet around – I assume things really heat up after 10:00pm (every day) when the late hour happy hour menu comes into effect (40% off!). The space had an open feel to it, high ceilings and the uncovered pipes, vents, etc. made it have a cold industrial feel that was tempered by the rich browns and dark tones of the tables and chairs. Overall, very comfortable and reminded me of a few places I had been to in Seoul over the years. The room was more than half-full as we were led to our four-seater table, coincidentally one that didn’t have an exhaust vent hanging from above – fortunately, barbeque was not in our plans on this night as my heart was set on the noodles. Originating in what is now North Korea, traditionally mul naengmyeon is served in a stainless bowl (I assume partly to help retain the cold temperature) and decorated with toppings such as thin slices of cold beef, half a boiled egg, and uncooked julienned vegetables, and slices of Korean pear. As additional flavorings, bottles of mustard and vinegar are brought to the table, to be added according to your own personal preference. 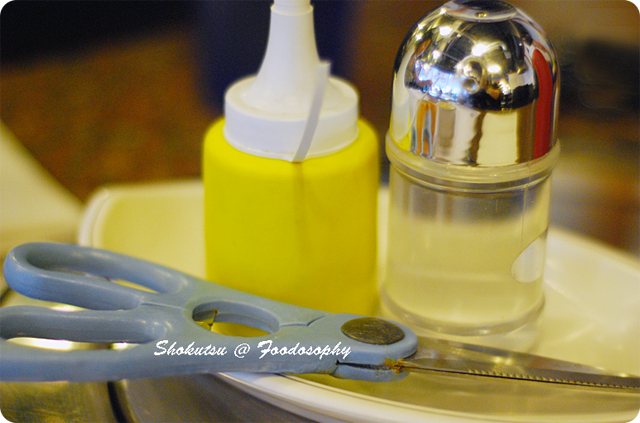 As well, a set of kitchen scissors are used to help cut the lengthy strands of naengmyeon into more manageable portions. Mul naengmyeon, despite its simple appearance, is really hard to get ‘right’, as more often than not, the soup broth will be ‘off’, and this happens even in Korea. So with a bit of doubt, I ordered the dish hoping that this would be a positive case. And as luck would have it, it was! A very authentic tasting broth, nicely chilled with ice, and the noodles were the right texture and silkiness that one seeks in this dish. I will definitely be back when I have another craving for it – listed menu price of $9.95. The other dish that came to our table was the stone pot bibimbap ($10.95). 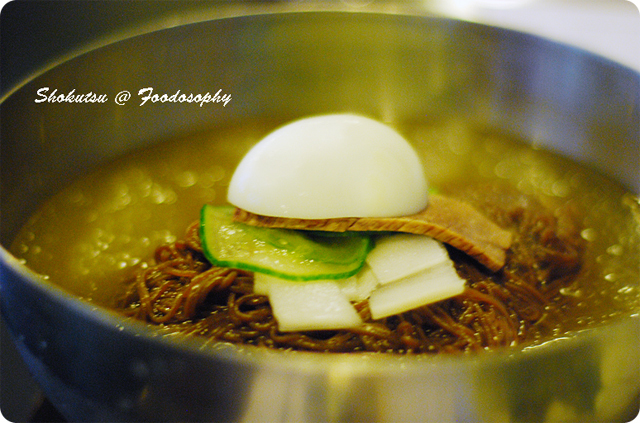 I know, a big contrast to the cool mul naengmyeon. Bibimbap simply explained for those unfamiliar, is a dish that consists of a bowl of steamed rice that is topped with various ingredients such as beef, egg, sautéed vegetables and of course, gochujan (chili paste) for the spicy zing. It comes spread out evenly on top, and is visually a very pleasing dish to behold as its brought to one’s table, and before you mix it all up to incorporate the entire range of flavors into every mouthful. The hot stone pot variety gives it the added twist of making the rice hidden below a bit crunchy and adds a somewhat smoky flavor to it, and I prefer it to the standard version that is served in a regular bowl. The version at DBBG was nicely put together I thought, perhaps a bit more beef than I would normally like (I know, some of you will say how can you turn down meat in a Korean restaurant), and a bit less rice that I would have hoped. Other thoughts on my visit include the ‘warning’, that during the busy periods of the dinner rush, you should expect perhaps less than attentive service. There were simply not enough servers to cover all the tables, and I could see they were always busy rushing around. Just bringing the dishes to tables is not all they had to do, as for some dishes that were actually helping grill, cut, and mix things together for customers, thus taking their attention away from the main floor. You’ll often find, here in North America and even in Korea, that really fake smiles and ‘let me get to know you’ attitude does not really exist among waiters/waitresses, so for those unfamiliar, you may feel that the service is cold and perhaps even business-like, but I can assure you its not the case, its just the norm. Throw in the fact that its likely the servers are mainly students here on short-term stays.